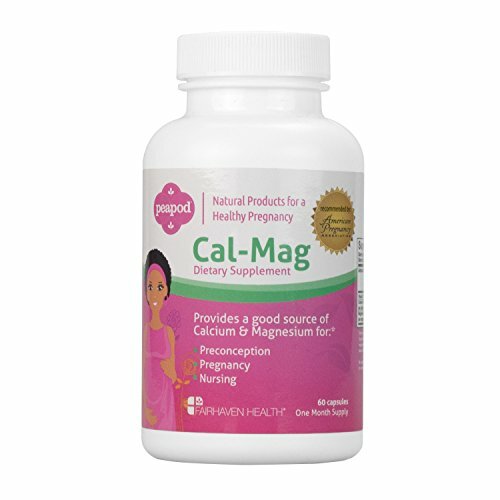 PeaPod Cal-Mag delivers an ideal supplemental amount of calcium and magnesium, along with Vitamin D3, for trying-to-conceive, pregnant, and nursing women. Calcium is well-known for its importance in maintaining and promoting bone health, but calcium is not able to do its job without the help of magnesium and vitamin D: magnesium helps transport calcium into the bones and vitamin D enhances the absorption of calcium. As a result, adequate dietary intake of each of these three nutrients is important for women of all ages and life stages, to maintain strong bones and healthy teeth and to support the colon, heart, muscle, nerves, and the immune system. Optimal intake of calcium, magnesium and vitamin D3 is even more vital during pregnancy and lactation, when a woman's own nutrient stores are constantly tapped to ensure her growing child is properly nourished. PeaPod Cal-Mag provides supplemental calcium and magnesium, to help ensure that your total dietary intake of these key nutrients is sufficient to maintain bone health before and during pregnancy, and during lactation. In addition, PeaPod Cal-Mag was carefully designed to ensure efficient absorption of both calcium and magnesium. While this product contains calcium carbonate and magnesium oxide (two commonly used forms of calcium and magnesium in dietary supplements), PeaPod Cal-Mag also contains calcium citrate and magnesium citrate. Because calcium and magnesium are best absorbed in an acidic environment, the citrate (an acid) forms of these minerals can enhance absorption, especially in people with low stomach acid production. If you have any questions about this product by Fairhaven Health, contact us by completing and submitting the form below. If you are looking for a specif part number, please include it with your message.